Senegal (French: le Sénégal), officially the Republic of Senegal (République du Sénégal), is a country in West Africa. It owes its name to the Sénégal River that borders it to the east and north. 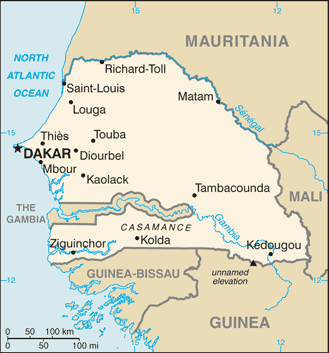 Senegal is externally bounded by the Atlantic Ocean to the west, Mauritania to the north, Mali to the east, and Guinea and Guinea-Bissau to the south; internally it almost completely surrounds the Gambia, namely on the north, east and south, except for Gambia's short Atlantic coastline. Senegal covers a land area of almost 197,000 square kilometres (76,000 sq mi), and has an estimated population of about 13 million. The climate is tropical with two seasons: the dry season and the rainy season.